For starters, GDTF and My Virtual Rig (MVR) were demonstrated at the fourth annual Vectorworks Design Summit in November. 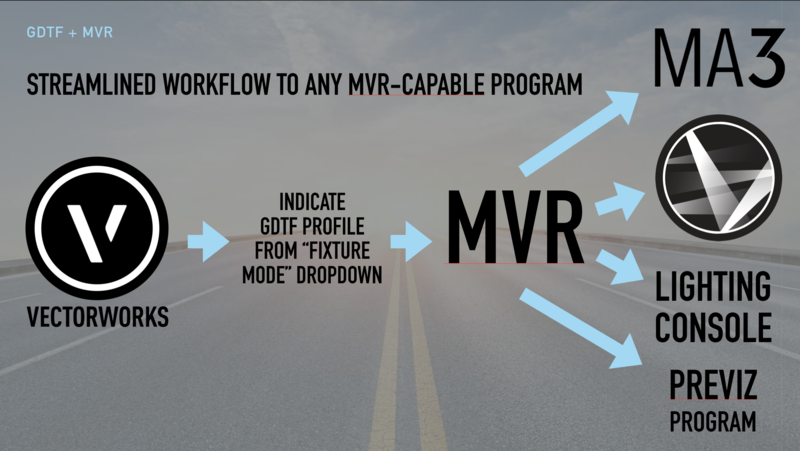 Released in Vectorworks 2019 this past September, MVR is an open-file format that provides a complete 3D model with data describing the different fixtures’ locations and GDTF files for the lighting fixtures used in a design. At the Summit, GDTF and MVR were showcased during the CEO Keynote. They were also demoed in the Previz Studio and during the session, “The General Device Type Format (GDTF) and How to Add it to Your Workflow,” led by Theresa Hull, designer at Visual Workhorse, Inc., with help from René Berhorst, head of product management at MA Lighting International. 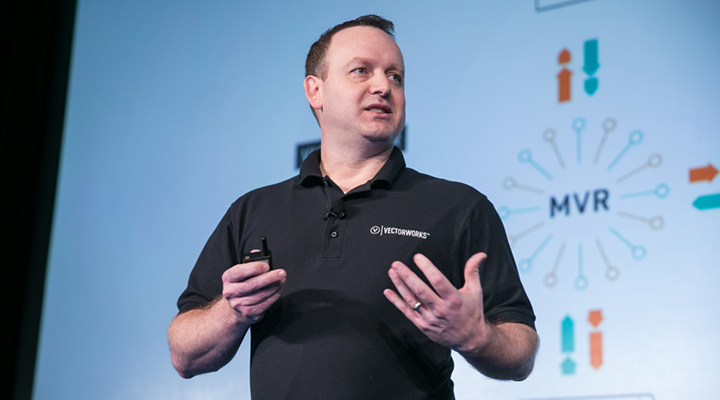 Hull compared the current workflow of moving designs from Vectorworks Spotlight to the previz app Vision, and consoles such as the grandMA2, with the new possibilities that GDTF and MVR promise; pointing out that the effort to bring to life the two formats is a huge community service project to the entertainment community. Prior to MVR, how Vectorworks exported to grandMA. Image courtesy of Theresa Hull’s Design Summit presentation. 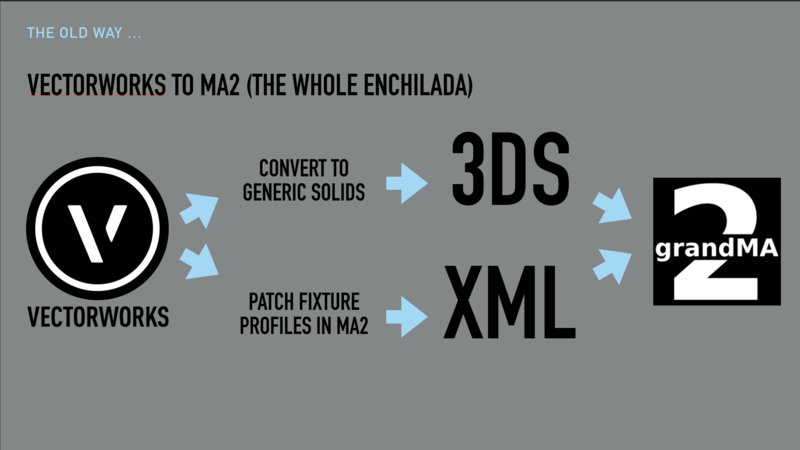 The new workflow includes data, and geometry in a streamlined workflow, thanks to the joint development of GDTF and MVR. Image courtesy of Theresa Hull’s Design Summit presentation. A new web-based fixture builder is now in private beta with select lighting device manufacturers. The fixture builder makes use of the current GDTF version and allows manufacturers (and eventually end users) to create GDTF files for their fixtures. This greatly simplifies the process and reduces the amount of time it takes to generate GDTF files. Based on modern web technologies, the fixture builder also ensures cross platform usage. The GDTF fixture builder start page. 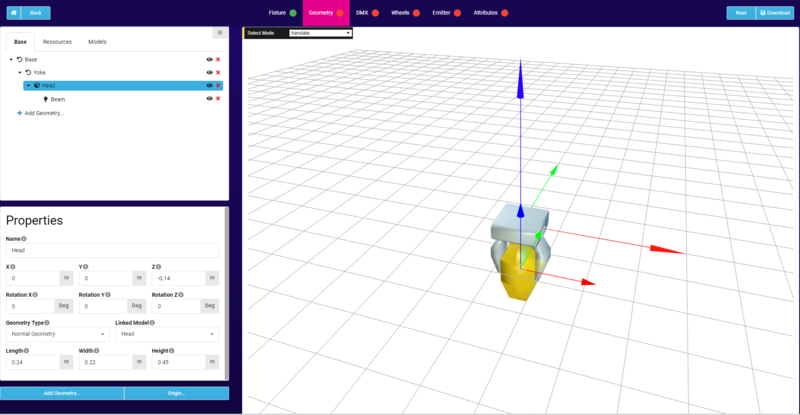 In addition, the GDTF fixture builder features many important tools covering multiple tasks related to GDTF editing, such as a 3D Model viewer and parameter editor, Content wheel creator for Prism, Gobo or Color wheels definitions, and a DMX builder to define simple or complex DMX Modes together with advanced features like Channel modes and relations. A dedicated LED emitter section allows users of the fixture builder to add, edit, and visualize spectral power distribution. When using the Fixture Builder, GDTF files can be created very quickly thanks to possibilities to copy/paste entire sections or to import existing files with prepared definitions. Created files are also ensured to be correct to given GDTF specifications through internal validation processes. 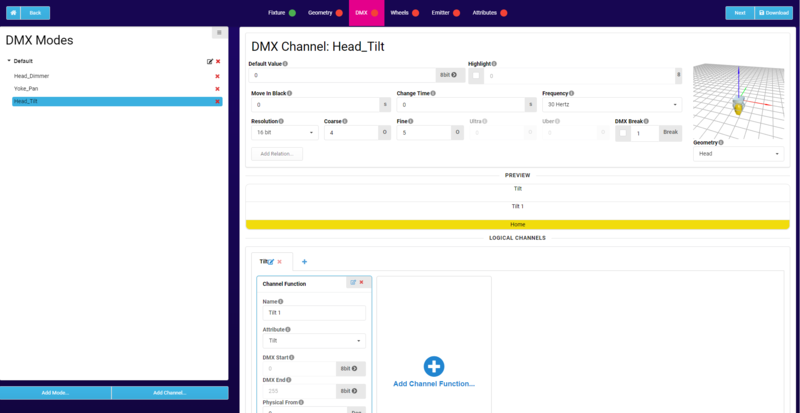 The two photos above illustrate an example of the DMX builder’s functionality. The fixture builder is now in private beta with fixture manufacturers for the upcoming months to get it to top-notch quality. Manufacturers interested in participating in the private beta should email info@gdtf-share.com. 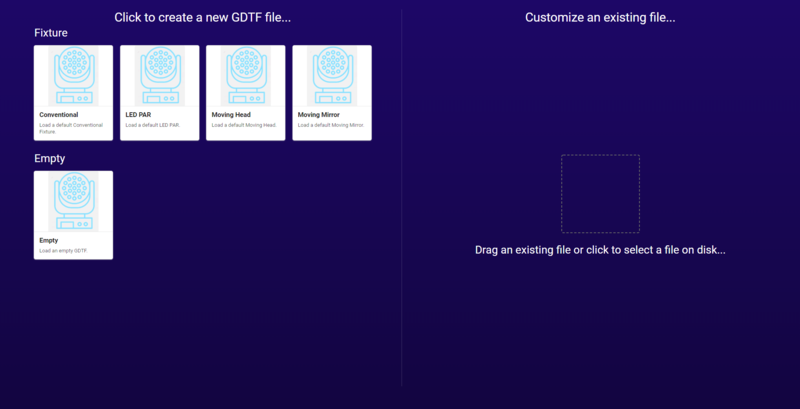 Once completed, this latest feature will be free to use, and it will be available on GDTF-share.com. Last but certainly not the least, the user forum is now up and running on the GDTF website. Monitored by members of the three founding companies: MA Lighting, Robe lighting, and Vectorworks, the forum will be the central place for having discussions about GDTF and MVR, as well as receiving answers about progress or technical issues for the formats. The forum is simple to use and logins are free to setup. Let the GDTF and MVR conversations commence!